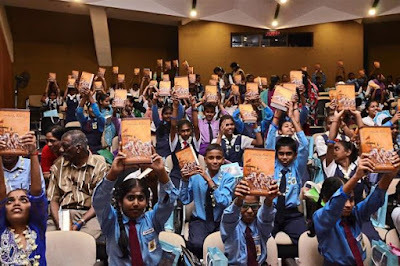 A TOTAL of 3,000 copies of the Hindu holy scripture — Bhagavad Gita were handed over to all 28 Tamil vernacular schools in Penang. Copies of the holy book were given to the primary schools in an effort to educate the young about the values in life to achieve unity and peace in the world. The event was organised by Global Integrated Transcendental Association (GITA) of Penang. Its president Madhusudan Das said through this event, the pupils would have the opportunity to learn anddiscover more about the Bhagavad Gita. “Besides these Tamil schools, we will also hand out copies of the Bhagavad Gita to other educational institutions, libraries and participants of ongoing programmes by GITA. “We aim to distribute 5,000 copies by the end of the year,” he said at the opening of the Penang Tamil schools’ GITA Programme at Komtar in George Town on Saturday. He added that the copies, which were given out were in English and Tamil. Madhusudan said GITA would hold a Gita Champion League, which would be a statewide competition on the reciting of the Bhagavad Gita. “This competition, which will be held both in English and Tamil, is to encourage students to read the holy book and to understand it,” he added. Details of the competition will be announced at a later date. State Youth and Sports, Women, Family and Community Development Committee chairman Chong Eng, who was present at the ceremony, said good values were important for a community. “Everyone can own the holy book, but it is more important to put in the effort to learn what is in the book and to follow it,” she said.